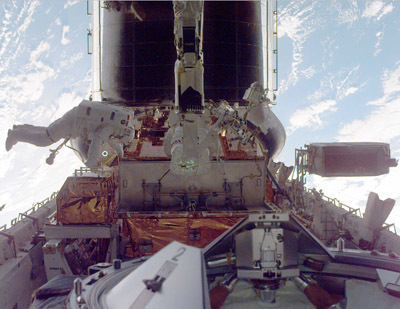 The primary objective of STS-103 is the servicing of the Hubble Space Telescope. 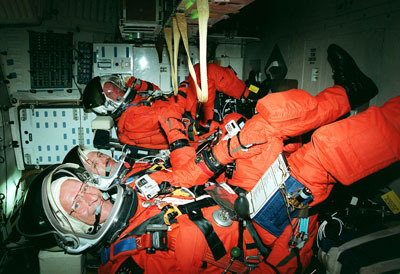 NASA officials decided to move up part of the June 2000 servicing mission after three of Hubble's six gyroscopes failed. Three must be working to meet the telescope's pointing requirements. The crew will replace a guidance sensor, HST's computer and install a voltage/temperature kit for the spacecraft's batteries. A new transmitter, solid state recorder and thermal insulation blankets will also be installed. 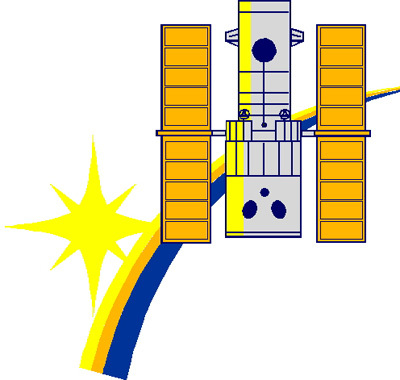 Launch attempt on December 18 was scrubbed, due to the prediction of poor weather. Launch attempt on December 16 was scrubbed, due to check quality control inspection. Launch attempt on December 09 was scrubbed, due to a dented hydrogen line. 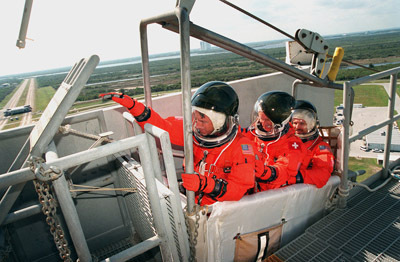 Launch attempt on November 09 was scrubbed, due to a damaged range safety cable. 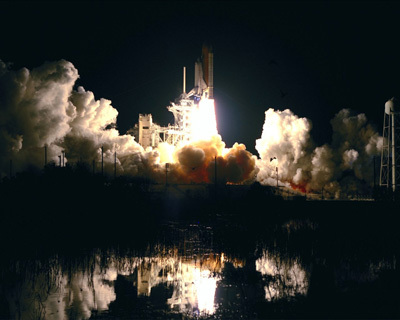 On October 7, with wiring inspections and repairs of Discovery and Endeavour nearing completion and similar work beginning on Atlantis, Shuttle program managers set new planning target launch dates for the next three Space Shuttle missions. At 5:20pm EST, Discovery was given a go for the deorbit burn. 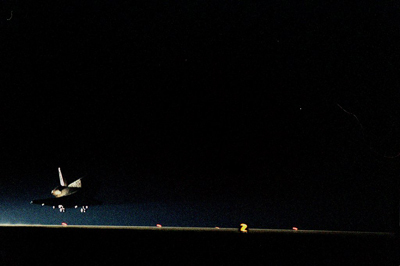 The first landing opportunity at KSC was waived off due to high crosswinds at the Shuttle Landing Facility. 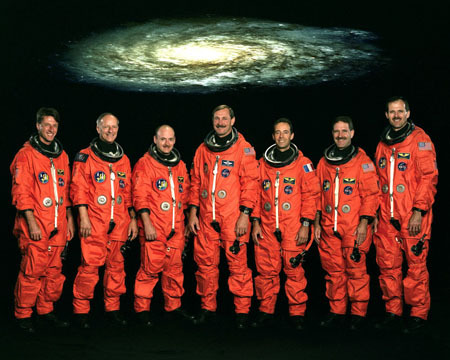 Day 1: Eight and a half minutes after the third and final shuttle launch of the year, Discovery was in orbit as its crew members began to configure shuttle systems. Day 2: The crew completed a day of preparation for a Tuesday capture of the HST. 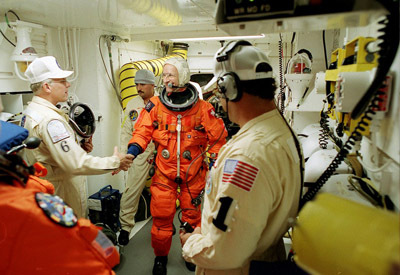 Discovery's orbit had been adjusted and the pressure in Discovery's cabin was lowered to 10.2 psi as part of the procedure to reduce the amount of nitrogen in the blood of space-walking astronauts. 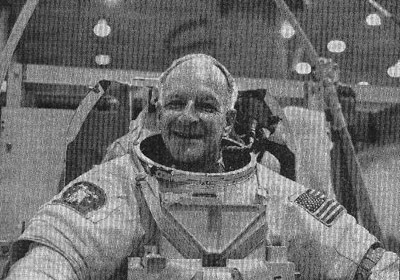 Later, Brown, Kelly, Clervoy and Foale participated in an on-orbit interview. Day 3: Controllers at Goddard Space Flight Center had placed the space telescope in an attitude with its closed aperture pointed toward Earth. Brown guided Discovery through an approach from below and fly-around. 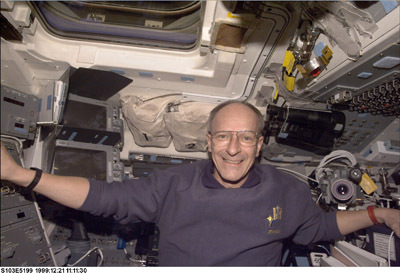 Then, Clervoy reached out with the shuttle's robotic arm to grip a grapple fixture on Hubble, rotated the space telescope and brought its base into the cargo bay. 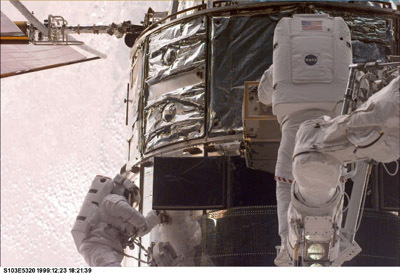 Hubble was firmly attached to the Flight Support System in Discovery's cargo bay. 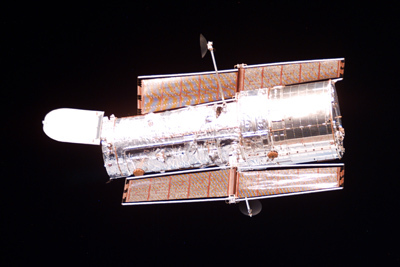 Hubble is as tall as a four-story building. With a maximum diameter of 14 feet, it is about the size of a railroad tank car. 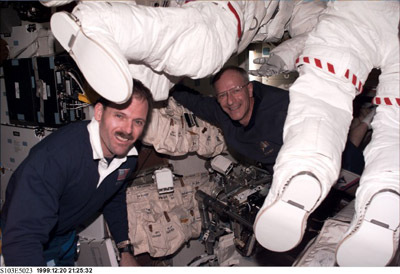 Day 4: During the first space-walk, Steve Smith and John Grunsfeld replaced the telescope's three Rate Sensor Units. Each contains two gyroscopes. 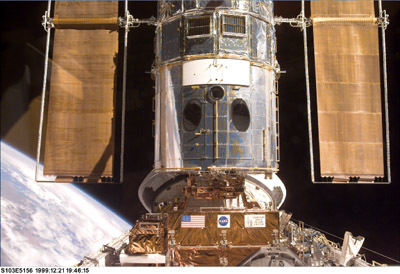 The second major task was nstallation of six Voltage/Temperature Improvement Kits between Hubble's solar panels and its six 10-year-old batteries. The cell telephone-sized kits are designed to prevent any overheating or overcharging of those batteries. 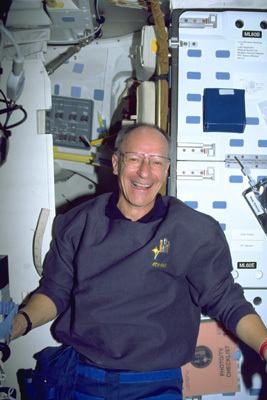 The HST received a new advanced computer from space-walking astronauts Mike Foale and Claude Nicollier. Their 8-hour, 10-minute space walk, the third longest in history, also saw replacement of a 550-pound fine guidance sensor. 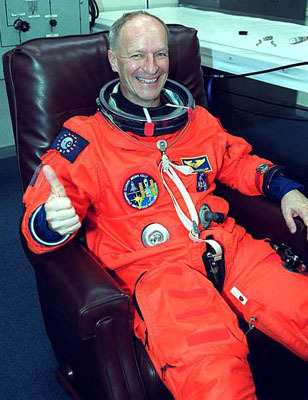 Flight controllers said all major activities of the space walk had been accomplished. 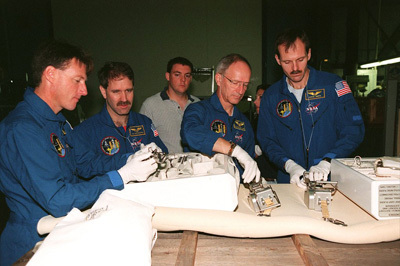 Controllers reported that power was reaching the new pieces of equipment. 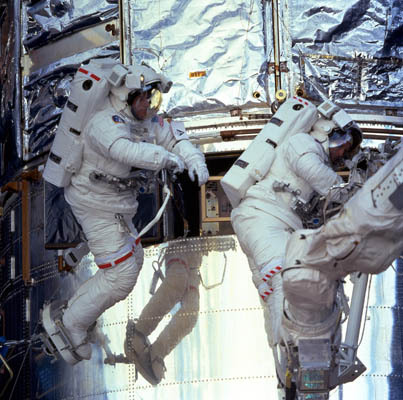 Day 5: Steve Smith and John Grunsfeld installed a transmitter that sends data from Hubble to the ground. They also installed a solid state digital recorder, providing more than 10 times the storage capacity of the old mechanical reel-to-reel recorder version.. They also applied new insulation on two equipment bay doors. Both the transmitter and the recorder checked out normally on early tests by telescope controllers. 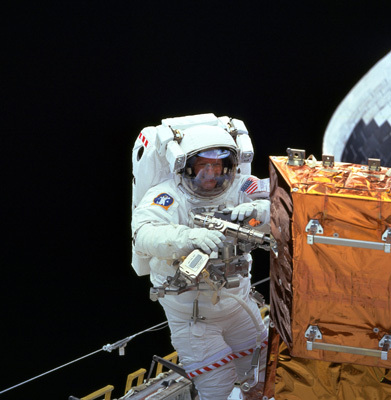 The space walk lasted 8 hours and 8 minutes, making it the fourth longest in history. 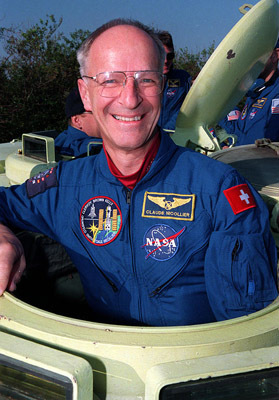 gently release the telescope, then placed the arm into an upright salute as Brown fired Discovery's steering jets to begin separating from the telescope. 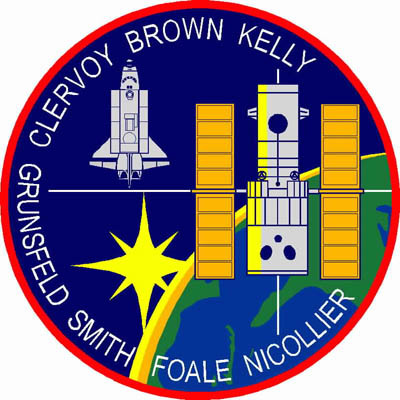 Brown executed a second steering jet burn, lowering Dicovery's orbit slightly, so that it would begin orbiting faster than the telescope and move away at just under 6 statute miles per orbit. 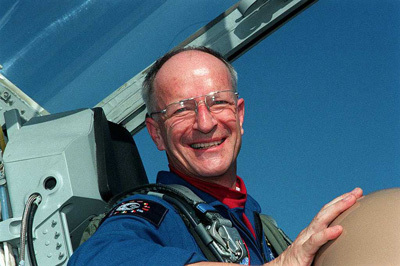 Afterward, each of the seven astronauts on board called down holiday wishes from space in several languages. 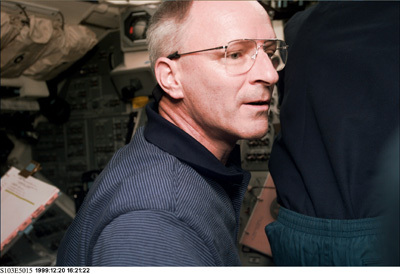 Day 7: Brown and Kelly performed checks of the Flight Control System The crew then did a check of the Reaction Control System, the maneuvering jets that steer Discovery while the Shuttle is in space. 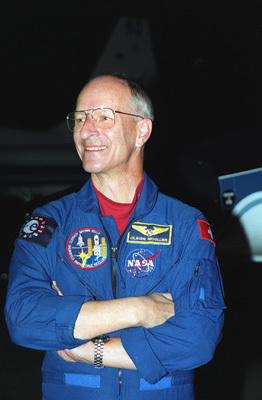 Day 8: After waving off the first landing opportunity of the day because of a concern with cross winds at the landing site, the crew was given a "go" to perform the deorbit burn. 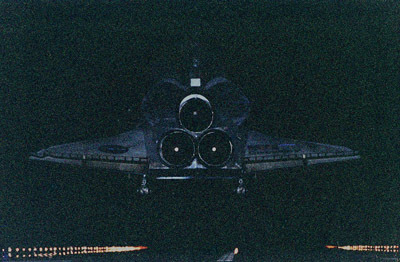 Discovery touched down at 6:01 p.m CST on Runway 33. The Crew will spend the evening in Florida before returning to Houston on Tuesday.